Not as complex as it may first appear. Put the cart near the first conveyor belt and a beam alongside to knock it onwards when the entry ball hits. 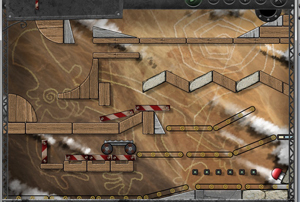 Set up the little bars like dominoes at the bottom left so that the last one falls onto the end conveyor belt.